How Ready is Last Mile Navigation for the IoT Technology? The Internet of Things (IoT), along with self-driving vehicles, is on the top lists of hyped technologies. Even though the technology is only emerging, interest in it keeps rising by the engineering community, from enterprises like Microsoft and Intel to technology enthusiasts. What is the IoT and why is it exciting? The IoT consists of our everyday devices which have embedded sensors, computing power, and network access. Those services are able to produce and gather information and interact with other machines without human interruption. Actually, last but not least: the IoT is a stack of trendy technologies made possible with infrastructure (cloud servers, broadband channels, and others) and existing software which can process the big data in order to make sense of it. The apps that form the relevant user experience are equally important as well. This is why the IoT opens great opportunities for business. The IoT devices need less human control on their functioning while processing a vast amount of information. They can gather statistics that were previously unavailable and produce a contextualized user experience (UX) on its base. For example, San Francisco International Airport started a pilot program to help visually impaired people navigate inside Terminal 2. This system utilizes Bluetooth low energy (BLE) beacons and passengers’ smartphones with a pre-installed app. As long as smartphones exchange information with beacons, the app highlights the route and points of interest with voice signals in order to guide the walker inside the terminal. Shopping malls can utilize this technology to attract customers who otherwise would not enter the facility because they would have trouble navigating the mall. Navigation technologies have made a significant progress since they were unlocked for civil use in 2000 to become context-based and socially driven. Route mapping is not the only function users need in their route mapping apps because the shortest way between two pins on the map does not equal the fastest and shortest journey – you can bump into unexpected changes (roadwork, traffic jams, no free parking, etc.). and even share parking time. In order for these features to function properly, they require constant and correct feedback. The data derived from human activity is then collected and analyzed by a variety of tech companies, from Google to data communities like OpenStreetMap, Waze and Streetline, the most recent arrival. The IoT technology can be utilized to automatically combine the navigational information from other sources and grant quick access to changing data. It is possible to build networks for big data transmission via various broadband mobile channels (Bluetooth, Wi-Fi, 4G), manage accumulated data in the cloud, and share it among cars, infrastructure, and people’s smartphones. Does the last mile navigation need IoT? Logistics and delivery. IoT will greatly enhance this sector with a higher level of automation and tracking. DHL believes that the IoT will increase the supply chains and delivery operations to the tune of $1.9 trillion and create more options and opportunities in the last mile. It will optimize costs while providing more reliable services for the same or lower price. In return, DHL intends to gather analytics which will make deliveries even more predictable. Retail and entertainment. Shopping malls can order the development of mobile apps to let an interactive navigation system greet customers right at the parking area, remember their car’s location and provide them with instructions about how to get to their car on the way back. Public places. IoT will provide a similar service for public spaces. 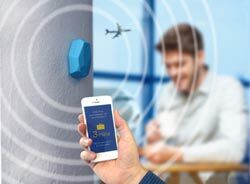 We are convinced that as soon as airports get positive feedback on the use of BLE beacons, they will introduce this technology to route travelers starting from the underground station or the taxi stand. This way, airports will improve their services and gather more detailed statistics on the time the passengers need to get onboard. Driving will become more comfortable when cars are able to communicate with smartphones. In order to do this, the navigation apps need to switch between the smartphone and the infotainment screen to display different modes. For example, on the road, the app displays the route, speed, traffic, etc. via the infotainment screen. When the driver parks the car in order to continue his trip on foot and turns off the ignition, the smartphone turns into pedestrian mode and displays the directions and distance on the smartphone’s or the smartwatch’s screen. When the driver returns to the car and starts the engine, the app switches to car mode and displays the road route again on the infotainment display. The navigation industry is ready for IoT. It has the relevant infrastructure and user scenarios where even Last Mile navigation can be used to boost businesses, optimize costs, and even generate revenue. Besides automating some aspects of communication with customers, it also collects statistics on visitors’ activities. Last Mile navigation is the missing link which will convert the journey from the home to the destination and ultimately the return home (human-computer interaction) into a cohesive UX – a modern navigation system. 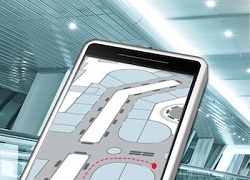 Indoor Navigation Apps Designed For the Visually Challenged: Why Does The Market Need Them? Indoor Navigation. Three Simple Steps To Increase the Precision.